This respectable lady, who was placed near her as a minister of the laws of etiquette, instead of alleviating their weight, rendered their yoke intolerable to her. 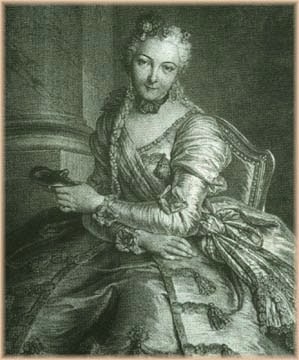 "Madame de Noailles," says Madame Campan, "abounded in virtues. Her piety, charity, and irreproachable morals rendered her worthy of praise; but etiquette was to her a sort of atmosphere; at the slightest derangement of the consecrated order, one would have thought the principles of life would forsake her frame. "One day I unintentionally threw this poor lady into a terrible agony. The Queen was receiving I know not whom,—some persons just presented, I believe; the lady of honour, the Queen's tirewoman, and the ladies of the bedchamber, were behind the Queen. I was near the throne, with the two women on duty. All was right,—at least I thought so. Suddenly I perceived the eyes of Madame de Noailles fixed on mine. She made a sign with her head, and then raised her eyebrows to the top of her forehead, lowered them, raised them again, then began to make little signs with her hand. From all this pantomime, I could easily perceive that something was not as it should be; and as I looked about on all sides to find out what it was, the agitation of the Countess kept increasing. The Queen, who perceived all this, looked at me with a smile; I found means to approach her Majesty, who said to me in a whisper, 'Let down your lappets, or the Countess will expire.' All this bustle arose from two unlucky pins which fastened up my lappets, whilst the etiquette of costume said 'Lappets hanging down.'"